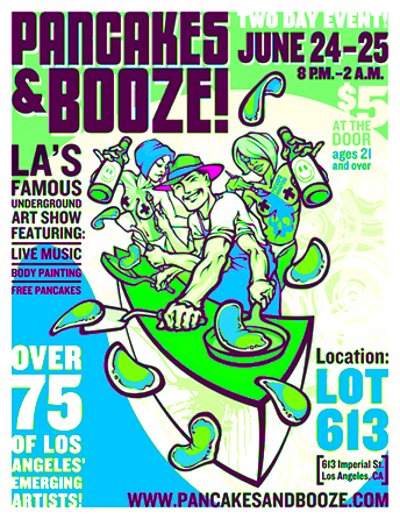 I exhibited 10 paintings at the “Pancakes and Booze” traveling art show in Los Angeles, Ca. on the weekend of June 24-25 2011. The event rolls through major cities all over the States and I am pumped to be a part of this get down!! Join the Facebook link below and check out the video to get a dose of this craziness!!!! I had a BLAST in Los Angeles and will see you all again on the next stop!!! FREE All-U-Can-Eat PANCAKE BAR & LOADS of ART from OVER 75 LOCAL ARTISTS!! !…2-DAY EVENT!!! Hit http://www.pancakesandbooze.com for more information and tour dates!! !